When Muriel Prince was working on her dissertation for her Master's Degree in Fine Art at Dundee University in Scotland on the question of why women make books, she contacted me with some questions. The dissertation is now finished. 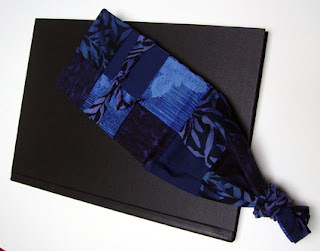 As she wrote to me, "I enjoyed every minute I worked on my dissertation & learned a lot, not only about other women book artists, but also about myself. I came to no clear cut conclusion, as I had expected, as to why women choose to make books. The reasons are as complex, varied and multitudinous as the books, and ourselves, but the journey was exciting, enlightening and educational." 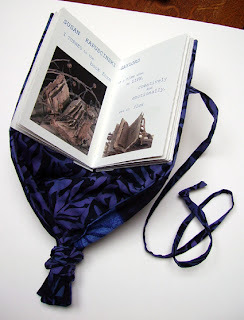 In addition to the conventional binding of her dissertation, she created a girdle book with a patchwork cover that contains extracts from the correspondences she received along with images of the work mostly gathered from websites. How interesting for a research topic! It is something to ponder, while I plan my next book!